It was great to see you earlier this week! The guide containing the curated-for-myth-tracing library eCollections we discussed in class is located HERE. Also, a little reminder about Pierre Grimal’s book being (at the moment) available only in the library’s print collection. This title lives in the reference room at number 292 G88. 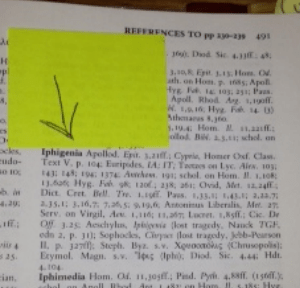 As I’m sure you recall, this is the volume that includes references and citations to additional iterations of particular myths and mythological beings. Good luck in your research and please be in touch with any research questions! Although a bit bizarrely unwieldy, this volume can potentially retrieve for you the most fantastic results. Remember this (which of course is also in your research guide :))? 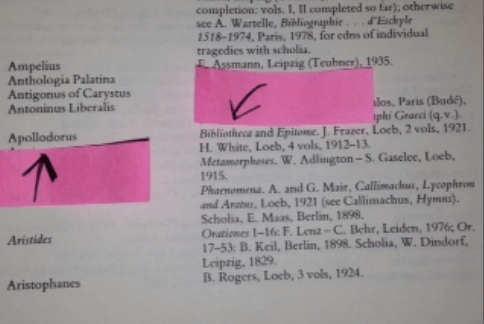 After these two steps we know that Apollodorus wrote about Iphigenia in the Loeb volumes titled Bibliotheca and Epitome. To locate either of these texts, we can now search the library catalog, Perseus Digital Library, HaithiTrust, and/or Google Books .